Image caption Juan Manuel Santos has reached a peace agreement with Colombia's largest rebel group, the Farc. "I will keep seeking peace until the last minute of my term," said Colombian President Juan Manuel Santos after voters rejected his peace deal with left-wing Farc rebels on 2 October. Farc and rebel negotiators returned to the drawing board and came up with a revised deal aimed at addressing some of the concerns of those who had voted "no". On 24 November, the two sides signed a revised agreement in the capital, Bogota. The new deal will not go to a popular vote this time, but will be sent to Congress for approval. If it passes, as seems likely due to the government's majority in Congress, his determination in the face of the shock result seems to have paid off. But Mr Santos did not always have the optimistic outlook and conciliatory tone towards the rebels he demonstrated in recent years. Less than a decade ago, while serving as defence minister, he authorised the controversial bombing of a Farc camp in Ecuador without informing the neighbouring country. Below, BBC Monitoring takes a closer look at President Juan Manuel Santos and his political journey from hawk to dove. Juan Manuel Santos' rise to power is in no small part due to his close ties with his predecessor in the presidential palace, Alvaro Uribe. Image caption Juan Manuel Santos (second from left) served as defence minister under President Alvaro Uribe (third from left). In 2006, President Uribe had just been re-elected to another four years in office on a promise of relentlessly fighting the Farc rebels. As part of a cabinet reshuffle, President Uribe appointed Mr Santos as his defence minister, a key role in a country which had suffered from decades of rebel activity. Mr Santos had supported Mr Uribe early on, founding a party to back Mr Uribe's campaign for president when the latter was still a relatively unknown candidate. As defence minister, Mr Santos soon made a name for himself with a number of key military operations. Under his leadership, the military freed kidnapped politician Ingrid Betancourt and three American citizens held by the Farc. The military also launched a bombing raid in neighbouring Ecuador which resulted in the killing of Farc leader Raul Reyes. But the 2008 bombing triggered a diplomatic crisis between the two neighbouring countries as Ecuador accused Colombia of violating its sovereignty. At around the same time, evidence also emerged that the Colombian military had been killing civilians and passing them off as rebels in order to boost its "kill rate". The scandal, known as the "false positives", is widely seen as one of the darkest chapters of the Uribe presidency. However, Mr Santos' approval ratings remained high and he resigned as defence minister in 2009 to be able to run for president in 2010. In March 2010, he won the presidential election with one of the highest number of votes in Colombia's history. He had campaigned on a platform of "democratic security", echoing many of the promises made by Mr Uribe. But soon after he became president, Mr Santos surprised many by breaking with the policies of his predecessor in office. He normalised relations with the left-wing Venezuelan government led by Hugo Chavez, with whom Mr Uribe had been at odds. He also prosecuted members of the previous government for abuses of power. In 2012, President Santos confirmed rumours that his government had been holding secret peace negotiations with the Farc in Cuba, hosted by the Communist government in Havana. As a result of these changes in policy, the two former allies became estranged and Mr Uribe became the head of the opposition in the country. Such was the level of enmity between the two politicians that when Mr Santos launched his re-election bid in 2014, Mr Uribe backed Mr Santos' rival for the post. But following a close run-off vote, Mr Santos won a second term in office on a promise of pursuing a peace deal with the Farc. In 2016, after almost four years of formal and two years of secret negotiations, President Santos announced that his government had reached a deal with the Farc that would bring "a long-lasting peace" to the country. The deal was signed in the Colombian port city of Cartagena on 26 September. 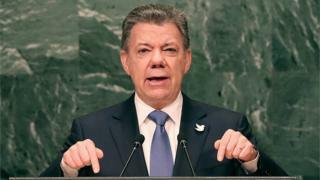 But Mr Santos had promised Colombians that any agreement would have to be approved by the country in a popular vote. On 2 October, Colombians narrowly rejected it - 50.2% of those who voted said "No". Many said the agreement was too soft on the rebels. Despite this, Mr Santos vowed to continue with negotiations for a final agreement, which the two sides have now signed. Mr Uribe opposes the new deal, which he says rides roughshod over the will of the people. The rivalry between the two men looks set to run on and on.